Abbiamo il piacere di ospitare nel nostro forum alcune rilevazioni e commenti da parte di un project manager di Meteo Swiss, il Sig. Stephan Vogt. Eccezionalmente questo thread sarà in lingua inglese in modo da poter condividere le nostre conoscenze ed informazioni. We have the pleasure to host in our forum some temperatures reporting and comments by a project manager from Meteo Swiss, Mr.. Stephan Vogt. Exceptionally this thread will be in English so that we can share our knowledge and information. Mille grazie per l’opportunità di beneficiare della vostre esperienza! Unfortunately my Italian is more or less inexistant, so I appreciate your offer to share our experiences in English. As already mentioned, I'm working at MeteoSwiss in the Data Integration departement but my activities in the field of frost hollows is done on a completely private basis. I found this forum while serching for literature on frost hollows. "Le fabbriche naturali del freddo" by Bruno Renon was an inspiration for my work and as far as I understood and learned your group managed it to create a group of passionates which ist helping to run your unique measurement network. I wish you all the best in your activities! 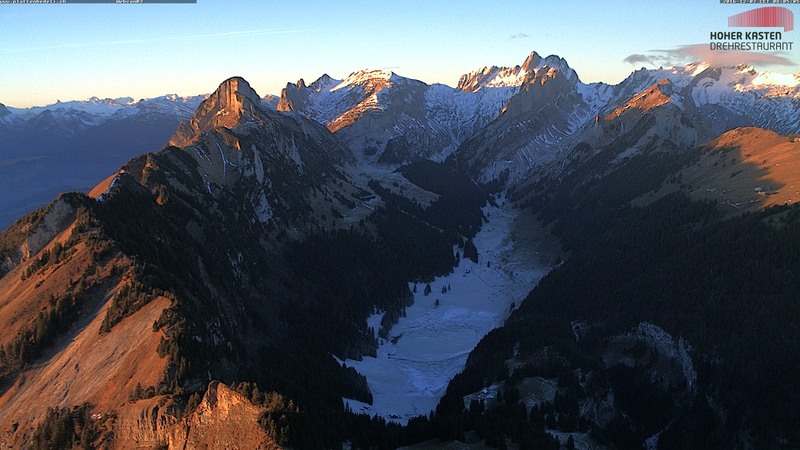 So far I run two stations in the north eastern part of Switzerland in the Alpstein massif. Perhaps you know Säntis (2502 m) which its famous mountain weather station. First results show that this frost hollow has a clear saisonality due to the presence of a lake. In addition it is very vulnerable to Föhn (downstream of the Rhine valley), resulting in remarkable temperature jumps. The Sky View factor is not optimal (0.84 - 0.87 at the ground). Note: in transparent blue, the contributing area to the frost hollow is marked. Due to the low temperature I was not able to collect the data from the logger (the notebook was not working any more...). This value is lower than any other station in Switzerland for the morning of January 6. Of course this value has to be regarded carefully and I plan to visit my stations on the next weekend. This will allow me to receive a reference for the temperatures taken with the handheld thermometer. Best regards and thanks again for your warm welcome! Thanks to share with us your experience. I Think you could find many iter experience and stories in this forum from 2008. I Hope that we Can create a Great discussion in English. If you have any question about our instruments or equipment or type of logging temperature..we Will help you to improve your sinkhole adventure. Thanks to join us!! 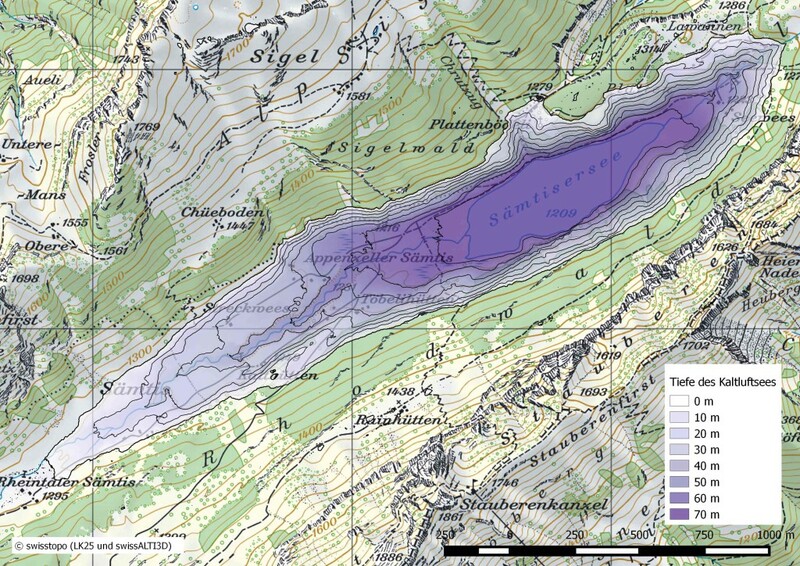 according to the cartographic data of Lake Sämtis site (seen in the map you pointed out before) it is not a real concave area, as revealed by the presence of the outflowing stream from the lake. It seems, instead, a flat plain at the bottom of a glacial valley, is it correct? So it could explain why you didn't measure, until now, very low temperatures there (clearly less cold than Hintergräppelen). I had a quick look to the map and seemed that there was a tributary (inflowing) stream of the lake on the right (East) and an outflowing stream on the left (West). Instead there are two tributary streams. Lake Sämtis is indeed a rather special frost hollow. It has a glacial origin and the ground has been sealed with loamy morain material. Just after the last ice age the entire sink hole was filled up with water. The lake drained superficially in north eastern direction. Over the time carstic processes resulted in sub-terrain drainage - and this may be unexpected - in eastern direction into the Rhine valley. This has been shown with tracer experiments in the early twentieth century. 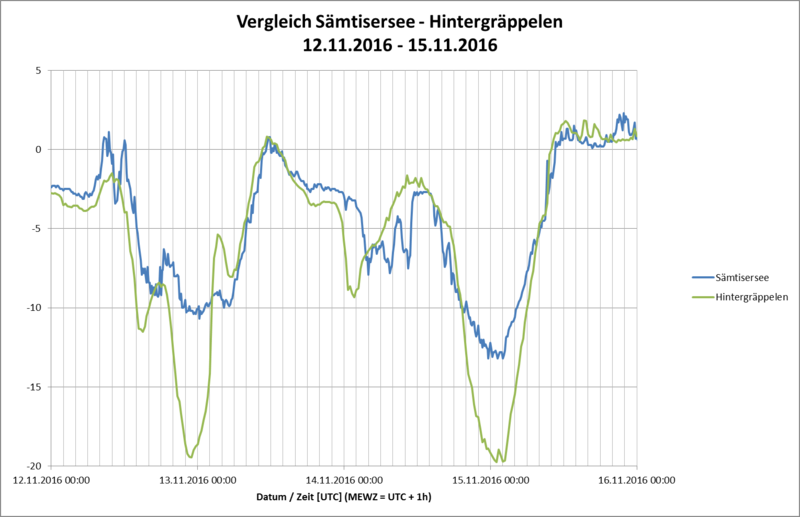 My last visit to download data from the logger @ Lake Sämtis was on November 20, 2016. We had a short period in November with winter conditions where the temperature dropped to -13.3 °C - which was a bit disappointing... The sinkhole was covered with snow and black has formed for the first time of the year, but every thing melted away after a few days. The best radiation properties are of course present when the lake is covered with ice AND snow: the radiation properties are then identical with the snow covered land surface. If you have snow on the land surface and black ice on the lake, radiation properties are different and I assume that a certain air circulation starts - which is not favourable for very low temperatures. Of course this circulation is reduced compared with an open water situation - but how big is the difference between "black ice" vs. "snow covered ice"? I'm looking foreward to my field trip this weekend: New data - new insights... Do you have frost hollows including a lake on the ground? What are your experience with this kind of frost hollows? We have monitored for 5-6 years (2006-2011) a frost hollow (Lago di Fosses, that means Fosses Lake) with a lake at its bottom (2142 m), but smaller than Lake Sämtis. Honestly I've never focused on this matter, I sholud examine better the data to understand better the effect of the lake at the begin of the winter. I'll tell my opinion this evening about the role of "black ice" and "snow coverd ice".